Salvatore De Vincenzo studied classical archaeology, classical philology and ancient history in Naples, Italy. Following this he attended a second master degree at the “Scuola di Specializzazione in Archeologia Classica” in Matera. In 2001 he joined the “Soprintendenza archeologica”, the Department of Conservation and Preservation in Campania, Basilicata and Sicily. He was doctoral fellow and researcher in the Panterlleria-Project at Eberhard-Karls-Universität Tübingen from 2005 to 2007. 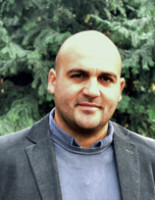 At Topoi he carried out his research as a post-doctoral fellow during 2008 and 2010. Since 2010 he has held positions in the Institut für Klassische Archäologie and the Friedrich-Meinecke-Institut at Freie Universität Berlin.